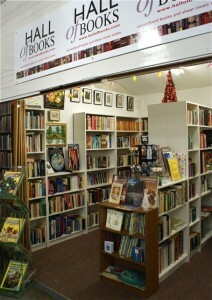 We recently opened a small bookshop in Oswestry Indoor Market, offering both secondhand books and sheet music. Oswestry Indoor Market has just won the national prize for the UK’s best Council-run Market. The shop has around 5,000 titles on display covering a range of genres and subject areas including: Body, Mind and Spirit, Religion, History, Music, Art and Design, Children?s Books, Photography, Crime Fiction, Travel and Transport, Food and Drink, Poetry, Plays, Biography, General Fiction, Crafts, Games and Hobbies, Reference, Social Sciences, Natural History, Gardening, Pets, Science Fiction, Horror, and Education. A selection of new reading accessories ? bookmarks, reading lights and magnifying glasses ? 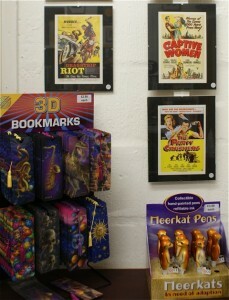 as well as secondhand art prints and pictures, is also on display. In the past, Oswestry has had several secondhand books shops in the town, while the Indoor Market has traditionally always had a bookshop. Economic conditions, the influence of the Internet and competition from the charitable sector has seen retail sales in the secondhand book trade hit particularly hard. The previous tenants in the market closed down last year and there are now no other dedicated secondhand books shops left in the town. Hall of Books started as an online retailer? www.hallofbooks.com – selling books throughout the UK and Internationally with orders regularly going to Europe, USA, Canada and Australia. With over 30,000 titles in stock (around 6,000 online at the moment), sales have developed year on year. Opening a ?bricks and mortar? 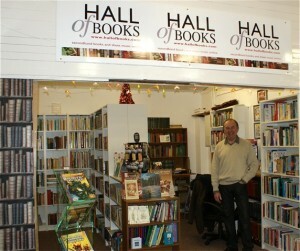 outlet to run alongside the online operation was always an ambition and, when the shop became available in the Indoor Market at the end of last year, Hall of Books moved in. Sales to date have been excellent with increasing repeat business, underpinned by the continued success of the online operation. The shop is open every Wednesday, Friday and Saturday between 9.00am and 4.00pm and can be found on the Balcony, Powis Hall, Bailey Head, Oswestry. Hall of Books does not specialise in any particular genre or subject area but offers an eclectic range of secondhand books and sheet music ranging from modern first edition hardbacks and quality paperbacks to the interesting, unusual and rare; the hard to find, collectible and out of print….and a lot more in between! ?Space in the shop is limited, but stock is updated regularly and items from the online inventory can be brought to the shop for customers to see. Books can be ordered for customers who are looking for something specific and stock items can be reserved for customers who have an interest in a particular subject area ? Sherlock Holmes, Printing Techniques, How to Draw and Paint, The Chatham Scandal and Wrecks of the Western Australian Coast being recent examples.